OK. Here’s your “Question of the day”: What popular product “mascot” was discontinued almost 40 years ago for being overly offensive to Mexicans? Everybody loves Fritos corn chips, right? But even a popular product like Fritos can make questionable decisions, which they did with their one time product mascot. In 1967, the good folks at Frito-Lay came up with a new mascot they dubbed “The Frito Bandito”. The Frito Bandito was a classic Western movie stereotype of a Mexican bandit, complete with droopy mustache, unshaven face, unkempt hair, and even a gold tooth! Oh yes, let’s not forget his big yellow sombrero. He packed two big pistols and had bullets lining his holster which wrapped around the front of his chest in an X-pattern. The Frito Bandito brandished his ominous guns and wanted to rob the television viewer of their Fritos corn chips. (Naturally) He was “pursued” by the FBI… the “Frito Bureau of Investigation”. The character was, surprisingly, voiced by the great Mel Blanc (1908-1989), probably the most popular and beloved voice-over artist of all-time. Mel gained fame and cartoon immortality by voicing many beloved characters, including Bugs Bunny, Daffy Duck, Elmer Fudd, Yosemite Sam, Porky Pig, Foghorn Leghorn, and Pepe Lepew, among countless others in the classic “Warner Bros” cartoon staples. He also was the voice of Barney Rubble on the first animated TV series, “The Flintstones”. The Frito Bandito also bears a slight, not-so-amazing resemblance to another classic Mel Blanc character, “Speedy Gonzales”, a Mexican mouse with a thick accent who charmed the senoritas, wearing a big yellow sombrero and racing around at blazing speed. The problems for the Bandito started after a few Frito Bandito national TV commercials aired. A group called “The National Mexican-American Anti-Defamation Committee”, not surprisingly, got pretty riled up and lodged some angry complaints over the mascot. The Fritos folks, instead of outright scrapping the whole Frito Bandito shtick, decided to “fix up” the character instead. And so it was, a newer, less offensive Frito Bandito was born. Gone was the razor stubble, and the gold tooth; his formerly unkempt hair was also now neatly combed. Did the new image work? The complaints from the group continued and the Frito Bandito’s days were numbered. In the end, for such an obviously “offensive” character, the Frito Bandito had a pretty good run. 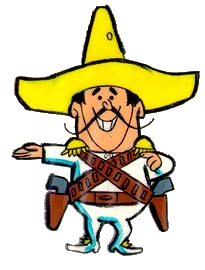 After first lifting up his twin pistols in 1967, the “not-exactly-beloved” Frito Bandito robbed his last television viewer of his Fritos corn chips in 1971, managing to last a lot longer than most animated characters or product mascots. You can check out one of the Frito Bandito’s ads here. Adios amigo! You are also correct, I should have wrote that variation of the line in the article was stated in Blazing Saddles. The original was of course said in TSM. Gold Hat: Badges? We ain’t got no badges. We don’t need no badges. I don’t have to show you any stinking badges. I take Frito corn chips, I take them from you! I didn’t know where the erasers came from but I have seven of them in blue,red and one yellow.